What would summer be without ice cream? We can’t imagine it. At 40NORTH, we’re big fans of gelato. Our family hails from Naples, Italy, so we like to treat guests to traditional Italian creations. We’ve found that gelato’s creamy texture is a crowd pleaser every time—especially our hazelnut flavor, which tastes like Nutella. That’s always available at Piattino in Mendham, NJ. We also carry seasonal flavors like strawberry or raspberry, as well as the traditional dark chocolate and vanilla bean. Do you know the difference between gelato and ice cream? Believe it or not, gelato may be healthier for you. It has less fat and is made with more milk than cream and fewer egg yolks—if any. Also, gelato is churned at a slower rate than ice cream, so it’s more dense and sometimes more flavorful. The temperature at which it’s served is different too. 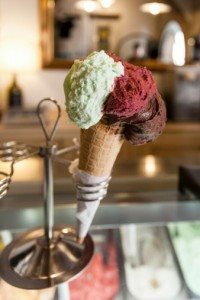 Gelato is usually served 15 degrees warmer than ice cream. If it were served at 10 degrees Fahrenheit—the ideal serving temperature for ice cream—it wouldn’t have its signature elastic texture. If you haven’t tried gelato, do it now. Tell us you read our blog, and a sweet treat will be in store for you!